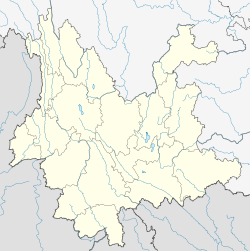 Lüchun County (simplified Chinese: 绿春县; traditional Chinese: 綠春縣; pinyin: Lǜchūn Xiàn) is located in Honghe Hani and Yi Autonomous Prefecture, in the south of Yunnan province, China, bordering Vietnam's Lai Châu Province to the south. The Lüchun County Almanac (1992) lists the following ethnic Hani subgroups (highlighted in bold) and their respective locations. The Luoluopo 倮倮颇 (lo33 lo55 pho21) or Luopo 倮颇 (lo55 pho21) are found in Luopan Shangzhai 罗盘上寨, Jinping County and in Zhongzhai 中寨, Dashuigou 大水沟 Township, Lüchun County. The Luopo of Jinping believe that their ancestors had migrated from Pu'er and Mojiang County, while the Luopo of Lüchun believe that their ancestors had migrated from Dali. Lüchun County Gazetteer Editorial Committee (ed). 1992. Lüchun County Gazetteer 绿春县志. Kunming: Yunnan People’s Press 云南民族出版社. This page was last edited on 10 August 2018, at 17:17 (UTC).